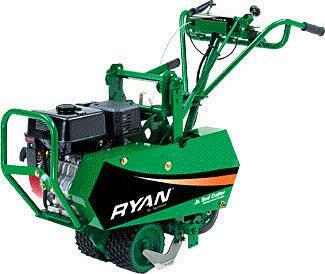 SOD CUTTER 12 INCH RYAN Sales Ft. Collins CO, Where to Buy SOD CUTTER 12 INCH RYAN in Ft. Collins, Wellington, Greeley, LaPorte, Loveland, Windsor CO and all of Northern Colorado. MACHINE WEIGHT 327 lbs., WIDTH 24", LENGTH 49"
CUTTING BLADE WIDTH 12", DEPTH ADJUSTABLE TO 2 1/2", PITCH 0 TO 9 DEG. WATER DRY GROUND the day before using.